When one hears the word "vocation" one usually turns their attention to thoughts of the priesthood and the religious life. Yet, the Church recognizes three vocations. So, what I would like to do this morning is briefly speak about the three vocations in terms of their relationship to each other and in turn, give you the catechesis on why your knowledge of this teaching is crucial for the future of the Church. Certainly, you may ask, "Father, why speak on the vocation to the priesthood or religious life if I'm already married?" It's an honest question that will receive an answer in just a moment. On the 4th Sunday of Easter, the Holy Father asks the priests of the world to preach on the topic of vocations. 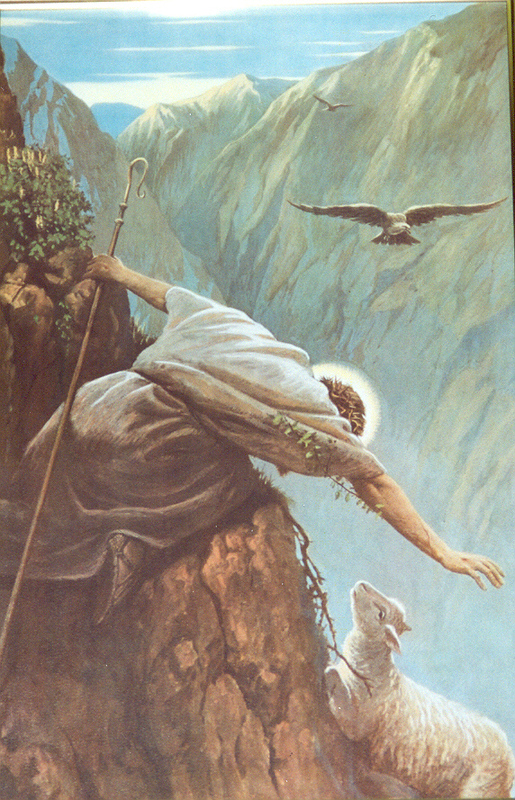 It's a very appropriate Sunday of the Easter Season to do this, as the Gospel today portrays Jesus as the Good Shepherd, one of the most ancient and enduring images of priests and bishops. But before I speak on any specific vocation, we do well to consider the notion of "vocations" in general. The word "vocation" is taken from the Latin root "vocare" which means "to call." It is God who does the calling and we recognize that he calls most persons to the married life; a significantly less number of persons to the single life; and then others to the priesthood and religious life. We need to make a distinction between careers and vocations. There are only three vocations but thousands of careers. A vocation is a call to a stable state of life that is discerned out as being God's way of leading a person to salvation. To say that the priesthood is a career would be no different than saying that marriage is a job. Marriage takes lots of work but it is a vocation, not a career. In fact, before couples marry, they should be able to answer two questions, "First, am I called to marriage? Second, am I called to marry this person?" So, rather than limit the word "vocation" to the priesthood and religious life, we ought to have a more expansive view of this term. The single life is a purposeful and deliberate choice for a state of life to forego marriage for the sake of being more available for the work of the Church in addition to career duties and obligations. The single life is not a "lonely hearts club" nor is it a state of life unintentionally chosen because one could not find a spouse. In our society, children are raised to be married persons. It's the most commonly chosen vocation and parents, whether they realize it or not. The marriage vocation is holy and it is the most ordinary path to salvation for the human person. And yet, marriage is an earthly reality. There is no giving or taking in marriage in heaven says Scripture. That is why God depends, in a way, on parents to be open to life so that they can make the "stuff" that God conjoins a soul to in order to bring that person to salvation. This bring us to the notion of celibacy, which is a gift from God to forego one's natural right to marriage and the benefits of married life and love. Celibate virginity consecrated for the sake of the kingdom of heaven is the highest vocation in the human family, higher than marriage. Why? St. Paul tells us that it is better not to marry because the married person is divided between affairs of the spouse and family and affairs of God. The celibate is totally dedicated to God as that person's object of focus. It should be noted that celibates themselves are not necessarily holier than married persons, but their objective state of life is a higher calling. This was defined at the Council of Trent in the 16th century and reaffirmed at Vatican II. When I was discerning my vocation, I had some friends who were very concerned that I may have the gift of celibacy. They thought it was so unnatural. They're right - it's not natural. Rather, it's supernatural. God does not call merely men to the priesthood - He calls celibate men to the priesthood, a different category of men altogether. It's a gift and a call all at once. Celibates live in their bodies now how we will all live in heaven, where there is no more generation of human life. Celibates are a sign in the world that as the vows go, "until death do us part" - marriage is a foreshadowing of a cosmic reality - the love Christ has for His bride, the Church. It's important for us to know about celibacy because if we don't see or appreciate its value, how can we possible encourage it among our young? This Sunday, as World vocations Sunday, asks us to examine our conscience in regards to how we encourage or discourage vocations to the priesthood and religious life. Sure, it's easy to pray for an increase in the number of priests and religious, but it's a more generous prayer to wish that God would honor your family with this sublime calling. God is never outdone in generosity and we ought to consider what we do to help encourage individuals to pursue this calling. The crisis in vocations is not that God isn't calling as many men to the priesthood and as many men and women to the religious life. God knows who He's calling and how many priests and religious He needs to conduct the affairs of the Church. The crisis is one of response! There's a lack of generosity in our day when we don't have enough priests and we need to take a hard look at why families discourage this vocation. My friends were worried that I would not be happy if I were not married. They change their minds when I cited that only 5% of priests leave the priesthood whereas over 50% of married persons divorce. I like my odds better. Other friends thought that not being married would mean that we priests are more susceptible to sexual crimes and perversions, as if to suggest that marriage is somehow a crime prevention program! As a priest of less than two years, I am humbled by this - to this life. The trust that is placed in us; the invitation into people's most intimate secrets as revealed in the confessional; the capacity to confect the body, blood, soul and divinity of the Lord of Lords and King of Kings in my hands at Mass - makes me stand in awe of the great gift that God has bestowed on the Church through this vocation. And yet, the answer to this crisis in response will ultimately be answered by families open to God's grace - generous parents who will encourage this vocation to be fostered in the home and who will train their children to esteem this most sublime calling. Priests can only do so much to encourage vocations but parents can do immeasurably much more. If the priesthood and religious life are seen as welcome vocations, children can respond in freedom. Let us pray that the Lord will give us many more shepherds after His own heart and that we will cooperate with God's grace to encourage a more generous response to this calling in our own age.